As you may have read before, my food plan right now is more of a relaxed ‘find foods that make me feel good inside and out’ one than a diet. It’s been going fairly well and I’ve gotten into a groove of cooking fairly nutritious meals. Then last week, Ed dropped the bombshell that he was going on a more intense health and fitness plan and he would be restricted to just 450 calories by dinner time. I’m not about to join him. Not only am I breastfeeding but I also find plans like that don’t work well for me. So, what to do? Do I eat separately from him, even though our evening meal is something we enjoy eating together? I already cook variations for the children as they are totally fussy (one day Carly hates potatoes, the next she loves them, it’s a total minefield!) so I’m used to changing things up a bit where necessary. The key has been portion size. We were already eating fairly healthily anyway, so it’s just a matter of cutting down what I serve for Ed for some meals. I’ve not been cooking any less, instead leaving the excess to be used for my lunch the following day and it’s been working quite well. Some meals don’t need cutting down – for example, we sometimes have steak with salad or vegetables. The cut of the steak is fairly small and so generally he can stay on plan without cutting down the size of the meal. He doesn’t need to miss out on family favourites like spaghetti and meatballs either, as long as we cut down the amount he has and we use turkey meatballs (which we actually prefer to beef anyway). I think the hardest part of Ed’s plan will be avoiding snacking in the evening, as we are awful for this. I’m hoping that Ed not being able to snack will help me make more sensible food choices when the kids are asleep and the ice cream and chocolate usually find a way out. Are you and your partner on different food plans? 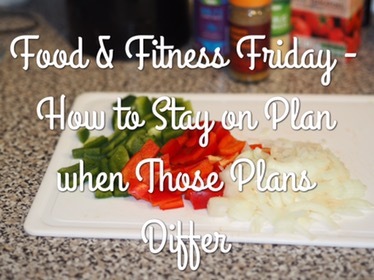 Do you have any other tips on how to stay on plan?